Someone got carried away with their QuadRotor project! Gas Electric Propulsion and battle gray! 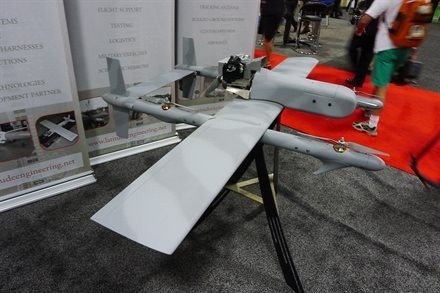 New at AUVSI was a variation on the quadcopter from Latitude Engineering of Tucson – the hybrid quadrotor, or possibly octorotor. A piston engine drives a generator, turning four electrically powered rotors (on the prototype). The next generation vehicle, weighing 60 lb, will have eight lift rotors installed in pairs, above and below the booms. Latitude says that three of the latter vehicles have been ordered by Naval Air Systems Command for a test program. This entry was posted in Aviation, engineering, Technology and tagged AUVSI, Quad copter by Sci Fi Engineer. Bookmark the permalink.